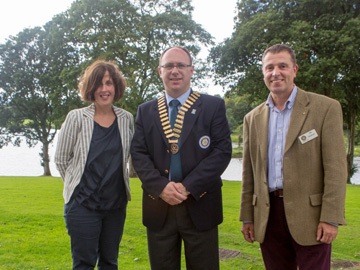 The Headmaster Mr Neill Morton OBE of Portora Royal School addressed Rotary on the 23rd June. He presented a personal view of the possible educational provision in Fermanagh in six years time. It was a vision of a future in which the young people were served by larger schools and could enjoy greater choice of subjects and activities. He believed that the amalgamation of Portora Royal School and the Collegiate would protect academic education for generations to come while ensuring that those who were not educated in the new grammar school would enjoy the parity of esteem and re-imaging which the new alignment of numbers and resources could bring. He pointed out how the proposal for three schools of 600 each was uneconomical and constraining. The additional pupils would absorb more money than the additional revenue would provide and a school of 600 would no longer qualify of the small school allowance which stood at £22,500 over the present revenue stream. He expressed his sadness at the rancour which the proposals have unleashed in the community and regretted that agreement had not been reached over the previous ten years of negotiations and talks around the falling school population of Fermanagh. When asked to comment on his recent award of an OBE, Mr Morton expressed his personal delight but acknowledged that he would not have received any award if the school he was privileged to lead had been anything other than highly regarded in the larger society. he thanked his Board, his colleagues and the students for their commitment to excellence over the years. Mr Morton thanked everyone for hospitality and the chance to address the members. Flight Lieutenant William J. Eames a member of the Royal Airforce, he was stationed at Souther Field in Americus, GA during World War II, under the "Arnold Scheme", Class of 42K. He made his first solo trip at Souther Field in 1942. Class SE-42-K arrived at Souther Field in June 1942. There were originally 175 members. Only 138 of the RAF cadets completed primary flying successfully and were posted to basic flying school. "In those days when you left home, it would be years before you would get back home. You just received letters. There were no phones". Flight Lieutenant Eames was seriously injured at Arnhem during the D-Day landings and to this day he still suffers from the effects: "I was resupplying the troops. On the first and the second days of Arnhem drops we took gliders. On the third day we were re-supplying troops on the ground and I was very badly wounded." His injuries prevented him from flying for the next five months. Upon his recovery he returned to active duty flying transport flights. He later became an Air Traffic Controller with the RAF. He left the service with a rank of Flight Lieutenant. He was awarded several medals including: the 1939-1945 Star, the Aircrew Europe State with France and Germanay clasp, Defense Medal, and the War Medal with Mentioned in Despatches Oak Leaf. After he left the RAF he still worked as an air traffic controller and as a flying instructor. he also worked as the Chief Flying Instructor at Netwownards Airfield up until the age of 70 and then in a part-time capacity until he was 80. When asked what was his fondest memory of the RAF and the aviation industry, he replied, "all of it." Denzil recounted his career of 40 years with the newspaper, beginning as a junior reporter in 1973. Denzil explained that he was a local man, educated at Enniskillen Model Primary School and Portora Royal. After a brief stint in the Civil Service, he joined the local paper. He was appointed as editor in 1987 by the late Joan Trimble. He was only the third editor outside the Trimble family, succeeding James Baker and Mervyn Dane. Denzil outlined some of the history of the Impartial Reporter, which was founded in 1825 by William Trimble, who was succeeded by his son William Copeland Trimble, who in turn handed over the reins to his son William Egbert Trimble. When Egbert died in 1967, his daughter Joan Trimble kept the paper in the family and then her daughter, Joanna McVey. This meant that in well over 180 years, five generations of the same family had control of the newspaper. As regards his own career, Denzil recounted a number of anecdotes about the famous people he met. However, he said he felt it was a greater privilege to meet local people who had entrusted him and the staff with their stories, particularly during the difficult years of the Troubles. Denzil said that the Impartial Reporter today was very different to when he started in 1973 but that was because society was different and a good newspaper reflected that. He said the paper always kept up to date, and he particularly praised the current staff and the editor, Sarah Saunderson. Asked about the future of the local paper, Denzil said he felt good local journalism had a great future and the Impartial served Fermanagh and the surrounding area in print, website and social media 24/7. 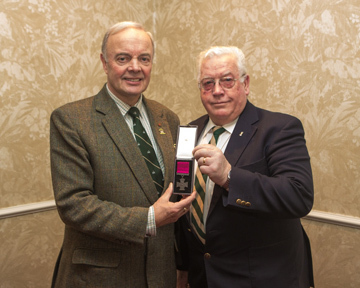 After a question and answer session with members present, Denzil received a much-appreciated gift from the president, Roy Crawford. David spoke of the importance of making a detailed list of all your valuables in your home e.g. televisions, jewellery, paintings etc. Also write down the value of each item, and clearly mark them with an invisible security pen, with your name and postcode, which enables it to be read under an ultraviolet light. David explained that it is good practice to take a photograph of each item and a room photograph of the position of each item you have listed. David highlighted the increasing phone calls which are known as “nuisance calls or cold calling”, these are people who state you have won a holiday or owed money due to an insurance claim, as you engage with the person on the phone they are trying to draw you into providing them your credit card details. Please remember to hang up immediately and Do Not Engage with the caller. Finally please ensure your front and back doors are locked even when you are in your home, as the burglar makes less noise than you do, so don’t give them the opportunity to view your home. My job title is Curator Manager of Inniskilling Museum and I am following in the steps of Major Jack Dunlop. I initially thought that such a job was for a retired Major but the Museum has to move forward in a different direction now. It is a steep learning curve for me, the role cannot be looked at on a commercial basis, we have an obligation to many people who want to remember those who have fallen, we cannot exploit what we have, it is not all about money. We are approaching the commemorations of the First World War, and as Curator I have to explore what we are going to do. I have to ensure that our archives are secure for the future. The amount of work that goes on behind the scenes is incredible; we have a core of 30 volunteers giving a total of 10,000 hours' work every year. Without them we could not survive, we have weapons experts, vehicle experts, accountants, marketing experience, historians, and also the regiment. Research is the most important thing we do, but we have to raise a charge for this, getting seven to ten requests per week, mainly relating to the first World War. We have a number of personal diaries, handwritten letters, private correspondence, we have plans to get these digitalised and then have them protected for the future, this will take three to four years and we hope to get funding from the Heritage Lottery Funds. The public face of the museum is as you enter the building, we have created a free exhibition that community groups, youth groups can borrow over the next few years. We have replica uniforms and weapons which children can handle, we also have a current uniform used in Afghanistan which the children can compare with a uniform from the first World War. Next year, we will be going back two hundred years to the battle of Waterloo at which both Inniskilling Regiments fought at. There are also further battles which we hope to recognise in the next few years. In July 2016 we will be celebrating the 100th Anniversary at the Castle, there will be a flagship event for Northern Ireland for the Battle of the Somme, there will be a memorial service in Belfast earlier in the day. It is going to be a very busy few years for the Museum, it is in a strong position at the moment but we hope to make it stronger. We have in excess of 30,000 artefact's dating back from 1689 through to 1968. We have two museums side by side at Enniskillen, one the County Museum run by Fermanagh District Council and the Inniskillings Museum. Both museums complement each other, with exhibitions going on regularly such as the Drumclay Crannog. Major (Ret'd) Jack Dunlop and Oliver Breen are very proud of the fact that ten men from the County Fermanagh have been awarded the worlds most coveted gallantry award, namely the Victoria Cross. These men have been lost to time and have no memorial to collectively recognise their gallant deed. This will be done by way of erecting a memorial to the men of the County who have won this most prestigious gallantry award. Once erected outside Enniskillen Castle Barracks this memorial will be the first of its kind in Ireland. Obviously the VC recipients came from both communities and the donations raised so far to erect this memorial strongly reflect this. This is a truly County Fermanagh Project and it will form a very fitting tribute to those servicemen who have received this unique gallantry award and one to be very proud of. The memorial has had planning permission and will cost in the region of £10,000. To date some £7,000 has been privately raised. This Monument must reflect the Valour of the Men from County Fermanagh who have won the Victoria Cross, Fermanagh People must be proud of these men and it is our responsibility that these men should never be lost in time. In a couple of months time Fermanagh will mark the historic visit of General Dwight 'Ike' Eisenhower to Enniskillen. The Five-star USA Army Supreme Commander, later to become the 34th President of the U.S.A., came here to review his troops prior to the Normandy landings on D-Day. His visit rubber-stamped Fermanagh as a pivotal stepping-stone on the rocky road to victory over Hitler's cruel tyranny. Ike will forever be remembered as a famous WWII General and American President, but he was also a proud Rotarian. 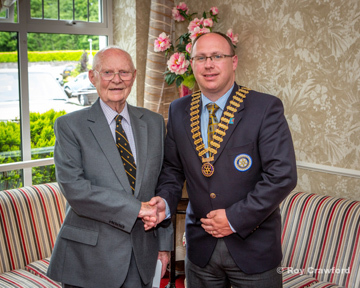 With the forthcoming 70th anniversary of his visit to Enniskillen pending on the 18th May 1944, Enniskillen Rotary Club invited journalist Charlie Warmington, and WWII archivists Roger Edmondson and Selwyn Johnston, to their evening meeting last week at the Killyhevlin Hotel to outline the background to the American men's sojourn in Fermanagh... for more. "MENCAP is a Northern Ireland wide organisation and I am from the Employment and Personal Development section, working mainly with schools and businesses in the Fermanagh and Tyrone area. The Employment service programme works with people who want to work in the business sector on a voluntary basis to develop their skills. We also check out what benefits people are entitled to, such as a bus pass, development of reading and writing skills. At present there are one in five people in Northern Ireland who have a disability, we speak to businesses to encourage them to give these people a chance in an employment environment. We will work with the business and the client and we can provide practical support helping them to deal with the work task, rather than the employer having to take time out to work with the client. We also offer training on Learning Disability Awareness to local businesses. We have a very high case load in Fermanagh, and our aim is to get these clients into the work environment." 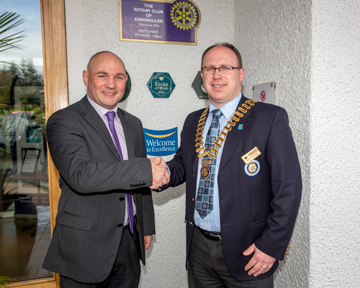 Rotarian Andrew Wilson gave an overview on his association with MENCAP. "At present I am working in Enniskillen Castle and it is one of the best work placements I have been in, the staff are very friendly and supportive. Denise is my support worker, when I first became involved Denise met with me and listened to what my requirements were. She took this on-board, and within a few weeks was back to me with a work placement. Although a person has a mental or a physical disability they can still do a job, but we need support from MENCAP. We can work with other people, it is very important to us that we can do this". 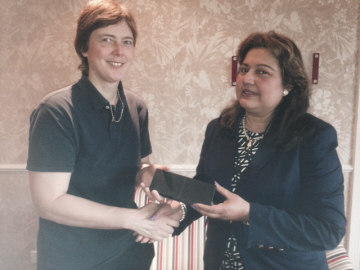 Anita is Chairperson of the Organisation and one of the Founder Members. "I have been involved in many projects and people continually ask me, come on board, you will be a new face that people have never met. We have fifteen nationalities in the Group, mostly working in the Health Service or Education, we have about 45 members. Our main work is to make people aware of our different cultures, and to help people from another country to integrate into the local community. We set up the organisation to raise the profile of the people from outside the country, and try to rule out racism. We have been helped by Fermanagh Trust and other organisations and have been running now for thirteen years, we are also involved in cross border projects. Our main aim is to go into the community groups, schools, we do fun things, serious things and help the local people to learn more about our culture. We are all volunteers working with youth groups, church organisations. Some organisations that I have visited ask what religion I am, I reply Hindu, and the next response is - are you a Catholic Hindu or a Protestant Hindu, my response to the question now is - I am a Fermanagh Hindu. From a work perspective, I am a personal trainer and facilitator, my selling point is that I come from India where all the eastern remedies have evolved; I have trained extensively in yoga and stress management. My husband is a trained engineer and is now a full-time manager. I started off in a volunteer organisation and I made many friends, volunteering is a wonderful thing, I was willing to learn new skills. I am involved in many local committees including the Siroptomists, and work very closely with disabled people. 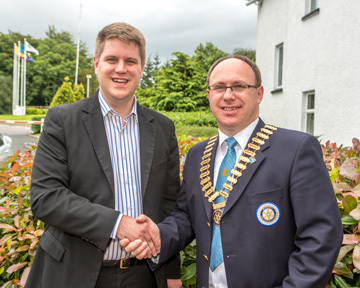 Recently I was asked to join the Fermanagh Community Policing Partnership which does a lot of work in rural crime." Anita finished off her talk by saying she had met many interesting people since coming to Fermanagh, and she enjoyed what she was doing within the Community. The speaker at our meeting on 13th January was local man Raymond Farrell who has worked for 33 years in Mental Health as a Cognitive Behavioural Therapist. 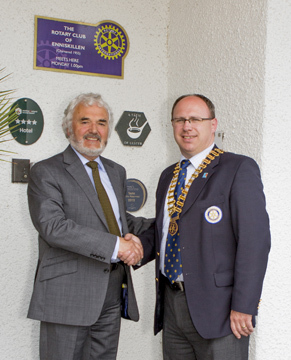 Raymond thanked the President for his invitation and prior to his talk he complimented the club on the excellent work they are doing in the community, even though people are busy they still take time to meet the needs of others. He made reference to the founder Mr Paul Harris who found that there was a need for fellowship and friendship among people, people were becoming isolated and caught up in so many things and didn't have time with one another, this room today is a testimony that people can take time out to meet. Our fathers were busy people in years gone by but they took time out to come together and we had a healthier race of people, a lot could be learned from that, the skill of communicating has been lost in 2014. "My role as a cognitive behavioural therapist involves meeting with people who suffer from anxiety, stress, depression, to obsessive compulsive disorders to post traumatic stress. It involves how people think which in turn determines how they feel, the average person has 60 to 80 thousand thoughts going through their head every day, and if you suffer from a depressive illness those thoughts are going to veer very much towards negativity. If a person continues to think negatively your whole behaviour will change, instead of being outgoing you are going to want to withdraw and not want to engage with anyone. That's what happens when people become depressed. My role is to help people look at how they think about things, looking at dealing with personal problems. The cost of mental illness today in Northern Ireland is about £2.8 million per year, we have to look at other ways to deal with this problem. Statistics for 2011 showed that 2 people died due to the security situation, 11 people died due to farming accidents, 59 people died on our roads, 289 died as a result of suicide, these were people who felt life wasn't worth living anymore, business men and women, people who couldn't find work, who weren't coping, several young people. Good mental health starts with me and you, we have got to start to look after ourselves, stress related illness cost the economy £13 billion with people being out of work, stress on its own is not a mental illness, prolonged stress can result in depression. We need to look after ourselves, take time out to enjoy ourselves, walking is an excellent stress reliever, take time out to eat, cut out the rubbish food, these leave us very vulnerable. We need to continue to do what we are doing here today, take time to eat, to communicate and to have fellowship together". 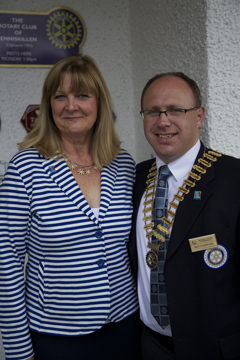 Following his address Raymond took questions from the Rotarians, and there was a excellent response from those present. On Monday 4th November Stephen McAloon and Paul Montgomery visited the Club to give a talk on Stroke Awareness. 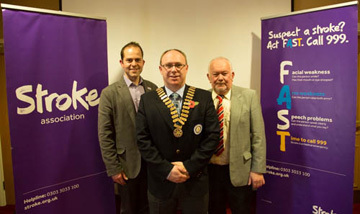 The organisation has been operating in N. Ireland for the last 20 years offering support to Carers' and family members and educating the public on the signs to look out for in recognising a stroke. In N. I. there is an average of 4000 people a year who suffer a stroke, and in Fermanagh almost 1200 people have been linked with having a stroke. A stroke is an attack on the tiny blood vessels in the brain, the blood flow to the brain is affected resulting in paralysis and communication problems. One of the major factors associated with a Stroke is high blood pressure, and the Stroke Association are promoting health checks in local shopping centres to make the public more aware. They are also actively promoting the F.A.S.T. campaign - face, (has the persons face dropped); arms (can they raise both arms above their head; speech (is their speech affected) and time (time to ring 999 if any of these signs are visible). The first three hours are very important in relation to helping a patient who has suffered a stroke, in this time the hospital can administer an injection which can help the patient back on the road to recovery. 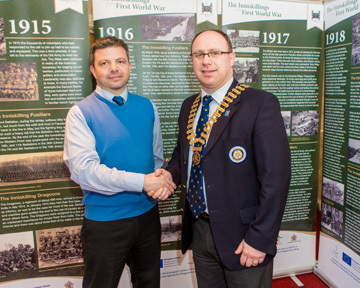 It is a great pleasure and honour to visit Enniskillen Club today. This club has a great history and record of club activity. 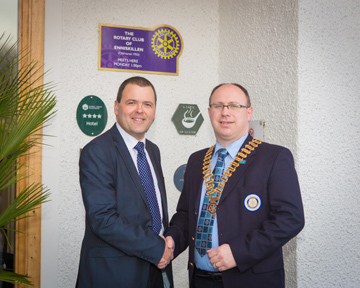 I would like to thank Rotarians John Trimble and Kenny Fisher for their generous donations to Project Ciara. 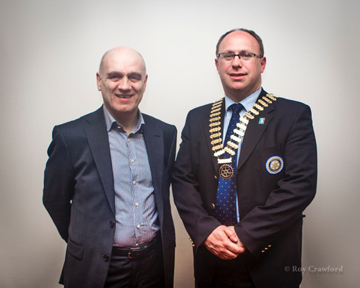 I would also like to thank the Rotarians and friends who attended the recent conference in Dublin. Communication is a two way process and I really enjoy being asked questions, if I cannot answer them I will find somebody who will. 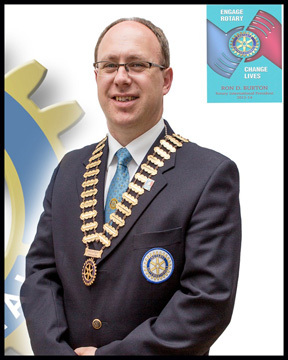 I too like to ask questions and my favourite one is - Have you ever been asked to join Rotary? On most occasions the answer is No, however, I am delighted that during my visit to the Townhall today I asked the question to the Chairman Alex Baird, and his response was “yes I have, it does not suit me just at present, but I will certainly give it my consideration in the future”. 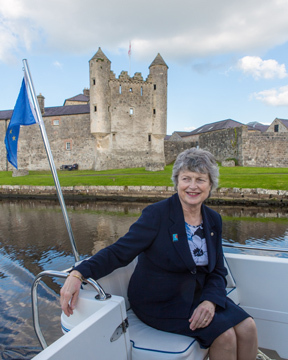 DG Verity spent the full day in Enniskillen .. for more. I would like to take this opportunity of giving you a resume of myself and my background. I was born 23rd March 1973 and christened Roy Edward Crawford. I am both a townie and countryman, having lived in Enniskillen and later Brookeborough, then back to Enniskillen. Both my parents have passed on, my father killed in the course of his duty on 1987 in Enniskillen and then my mother passed away in August 2011. I have 2 brothers and both are married. I am married to Carole for 15 years and we have Mark our son now aged 13 years, second year in Portora Royal School, we live at 2 The Willows, on the Tempo Road, Enniskillen. Firstly I attended Jones Memorial Primary School and Brookeborough Primary School, followed by Fivemiletown College and Fermanagh College. After college I worked in Engineering for 8 years, then studied in the funeral industry to become a funeral director and embalmer. Wesley and Hester Elliott are my parents-in-law and we all work together as a team in the family firm S.R.Elliott & Sons, Funeral Directors, 17 Darling Street, in Enniskillen. My hobbies are photography and I have a keen interest in nature, and landscapes photographs, as you all know, I also enjoy gardening and travelling, visiting new places. Travelling is a fascinating way to discover and learn new things and most of all spending quality time with Carole and Mark. Peter was a member of the 2013 Group Study Exchange group who visited the South Island of New Zealand earlier this year. He was one of a Group of five, four members and a team leader. 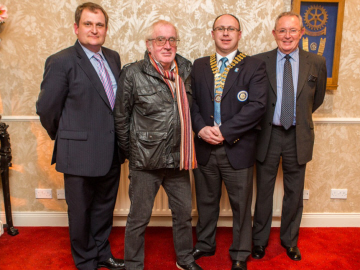 The group were hosted by eight different clubs during their visit and they stayed with Rotarians. Their stops included: Milton, Dunedin, Timaru, Christchurch, Cromwell, Queenstown, Invercargill and Gore. The Group visited various companies associated with their work back home, these included factories, boat building, farming, government departments. On the social side they had a flight around Mount Cook the tallest mountain, visited a venison farm, an adventure park, wine making region, bungy jumping, white water rafting and a flight in a Tiger Moth plane. The trip was a fantastic experience, and many friendships have been established. Ms Kate McAloon, who is the National Trust Visitor Services & Events Manager, talked about Training Opportunities within the National Trust for long term unemployed people. The Passport to your Future is a pioneering scheme for the National Trust. The Passport to your Future programme is looking for people with a passion for the work the National Trust does to come and train with us in some of our breath-taking places. Patricia Lindsay, District Foundation Chair gave a presentation on the Foundation Committee. Patricia outlined the Goals for the Foundation Committee - Eradicate Polio - primary aim; Launch of new Grants model; Clubs to engage in Projects; Build ownership in Foundation by supporting the Annual Fund. 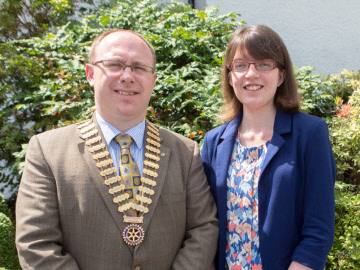 She also outlined the donations given by our Club during 2012-2013 - Polio Plus - $24,269; Annual Fund - $22,727; this worked out per capita at $435 which was the highest per capita figure in Rotary Ireland. Rotary gave a promise in 1985 to the children of the world to get rid of Polio, we are well on the way to achieving this. Patricia also outlined what grants are available from District. One such grant is available for the Club to request funding for a local project involving schools, health, or a community project which would benefit locals. She hoped that the Club would take up this offer soon as it has a closing date of 31 August. A vote of thanks was given by John Trimble Foundation Chair. The first speaker of the year was Helen McMorris, a Fingerprint Examiner working in Dundee. The aim of the talk was to give an insight into the world of fingerprints and look at what goes on in a fingerprint Bureau. A fingerprint is an invisible impression usually left behind in sweat on a surface that has been touched, they can also be found in blood and have also been found in food. The fingerprint is developed using specially designed fingerprint powders or chemical treatments, with aluminium powder being most commonly used. Fingerprint patterns are unique to each individual, however there are similarities between identical twins, but there is a difference between the patterns. There are four main types of fingerprint - plain loop to left, plain loop to right, whorl and arch, with loops being the most common. The fingerprint patterns were present from birth, with the print being fully developed after 24 weeks. The day to day job of a fingerprint examiner can be broken down into three main steps; analysing the fingerprint, compared against a known set of fingerprints; and finally, the result is verified by another qualified examiner. The fingerprint service in Scotland is divided between four cities, Aberdeen, Glasgow, Edinburgh and Dundee, there is one in N. I. at Police Headquarters in Belfast. It takes three years to qualify as a fingerprint examiner.